What are the consequences of wearing polyester clothes? Which diet results in the lowest rate of greenhouse gas emissions? What are the most environmentally-friendly modes of transportation in a city? These and many other questions were raised and answered during the Environment Week organized by students at CEU on March 18-22. Mridul Pareek and Anaїs Voski, MS students in the Department of Environmental Sciences and Policy as well as Alumni Scholarship recipients, came up with the idea to unite the CEU community around the issues of climate change, pollution and biodiversity loss in an educational manner. To do so, they organized infotaining events. Their activities coincided with a range of days designated to protecting the environment, such as Global Recycling Day and World Water Day, hence the CEU Environment Week was born. “Initially, we thought of an awareness-raising photo series for our project, which later on expanded to include an online quiz. During the conceptualization, we joined hands with Sustainable CEU for a workshop and then collaborated with Environmental Advocacy class students to convert our online quiz into a pub quiz. We were fortunate as our idea was well supported by our department as well as staff from the Alumni Relations, Communications, and Community Engagement Offices at CEU,” explained Mridul. The Pub Quiz marked the start of the Environment Week. Some 25 participants gathered in The Vegan Garden to compete in answering tough questions from Logan Strenchock, CEU Environmental and Sustainability Officer. A team with the fancy name “Compost Worms” triumphed, winning free vegan burgers as their prize. The runners-up received CEU merchandise — pens and reusable tote bags. The winners emphasied how educational and, at the same time, entertaining the quiz was for them. Another participant, MA student in the Department of Economics and Business at CEU Jibek Turgunbekova, happens to share their opinion: “The questions were not easy. My friend and I couldn't answer all of them correctly, but the main thing was not to win but to gain better awareness. I learned about many things — from what the most polluting means of transport is to the least environmentally-friendly food. Now what will make a change is implementing these eco-friendly tips into our daily routine”. The Environment Week continued with the Human RightS Initiative’s (HRSI) NGO Fair, which featured environmental NGOs, as well as The Sustainable CEU Workshop. The latter was held by Logan Strenchock and Orsolya Lazányi, PhD candidate from the Doctoral School of Business and Management at Corvinus University. They spoke about participatory action research — an alternative to traditional research which envisages the involvement of a researcher in community work. Through this framework, the speakers underscored that academia and communities can make sustainable changes together. - Follow the “5R” lifestyle of a “zero-waste” person: refuse, reduce, reuse, recycle and rot like Nina Lesikhina, MS student in the Department of Environmental Sciences and Policy, and Erica Beccarello, MA student in the Department of International Relations. - Care about wildlife by making bird-boxes and sow wildflowers like Michelle Osbourne, MA student in the Department of Gender Studies. - Bring your mug to coffee shops rather than buying paper cups, lower your heater and vote for green-minded parties like Floor Van’t Ende, MA student in the Department of Gender Studies. 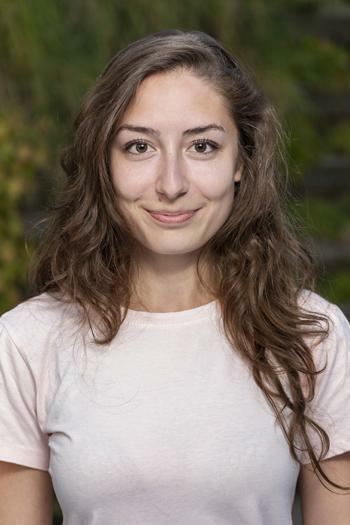 - Reduce consumption of meat, buy vegetables from local markets and avoid plastic like Zsofi Veer, MA student in the Department of Gender Studies. All in all, this Environment Week was a good kick-off. Current organizers, Anaїs and Mridul hope that the initiative will be taken on by future ASRs and expanded to a wider audience. They also would like to thank all those who took part in the project, including fellow ASRs who volunteered to contribute to the photo series. For now, as Jibek said above, let’s try to implement all these tips in real life and make a difference by taking small steps.